Ohio regulators will soon approve and permit large, exposed centralized impoundments that hold fracking flowback water. These are used widely by oil and gas companies in other states to recycle the waste and serve multiple wells near one another . The impoundments, or pits, which sometimes exceed the size of a football field and can hold millions of gallons of water, are now banned in Ohio. But they’ve proved a useful asset to companies operating in other states such as Pennsylvania and West Virginia. The impoundments serve as water-transfer stations for multiple wells nearby, greatly reducing the amount of truck traffic and the water necessary to drill and frack those wells. Existing Ohio regulations permit use of lined impoundments that hold freshwater for drilling. Flowback, or fracking wastewater, however, must be stored above ground in covered steel tanks before disposal or reuse. But effective Jan. 1, the centralized impoundment pools will be authorized by the Ohio Department of Natural Resources as part of a regulatory change state legislators made in the biennial budget bill signed in June. Changes to the law likely came after input from the industry. Operators consider centralized impoundments a key to further developing the Utica Shale play. 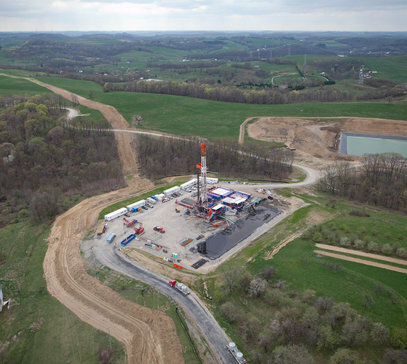 A shale well typically requires between 1 million and 8 million gallons of water to complete. Water from the wells generally comes from nearby, either from a public water supply, pond or lake. Trucks and pipelines are required to carry the resource to the drilling site. Last month, at an oil and gas conference in Youngstown, Harry Schurr, general manager of Utica operations for Pennsylvania-based Consol Energy, said central impoundments in Ohio would significantly aid further development here and help meet the demand for water in southern parts of the state where it’s not as abundant. Schurr said it also would help Consol, which has drilled about 215 wells in Pennsylvania and Ohio, to recycle the vast amount of water it requires for its operations. He added that the company hoped ODNR might soon approve the impoundments and believed it would do so based on interactions the company has had with regulators. Mark Bruce, an ODNR spokesman, said the agency is developing rules “that will clearly define standards regarding the construction, length of use, design and other factors” of impoundments. The move is likely to rankle oil and gas industry opponents, who three years into the play claim the state has become a dumping ground for wastewater. They’ve taken aim at Ohio’s injection wells, where the most recent ODNR data shows that 14.2 million barrels of fluid were disposed of underground in 2012. The centralized impoundments, which are roughly 200 feet wide and 300 feet long, or larger, are likely to draw the attention of critics. But engineers inside and outside the industry claim that when the pits are designed and built correctly, they are entirely safe. Fracking waste includes salt, dissolved solids and light radioactive and toxic metals from its contact with underground rocks. Chemicals added to the mixture contain volatile organic compounds, such as benzene and toulene. Pitzarella said misconceptions about the impoundments remain, despite safeguards and a closed-loop system. After use at a well site, the water is conditioned and some salt and dissolved solids remain. It is then transported and stored at an impoundment until its next use when it is mixed with freshwater for drilling.